Illinois homeowners pay the second-highest property taxes in the U.S.
New Tax Foundation study reveals that Illinoisans pay a second mortgage in property taxes. Illinois property taxes are now so high that they are equivalent to a second mortgage, according to a new study from the nonpartisan Tax Foundation, a Washington-based tax-research and -education center. 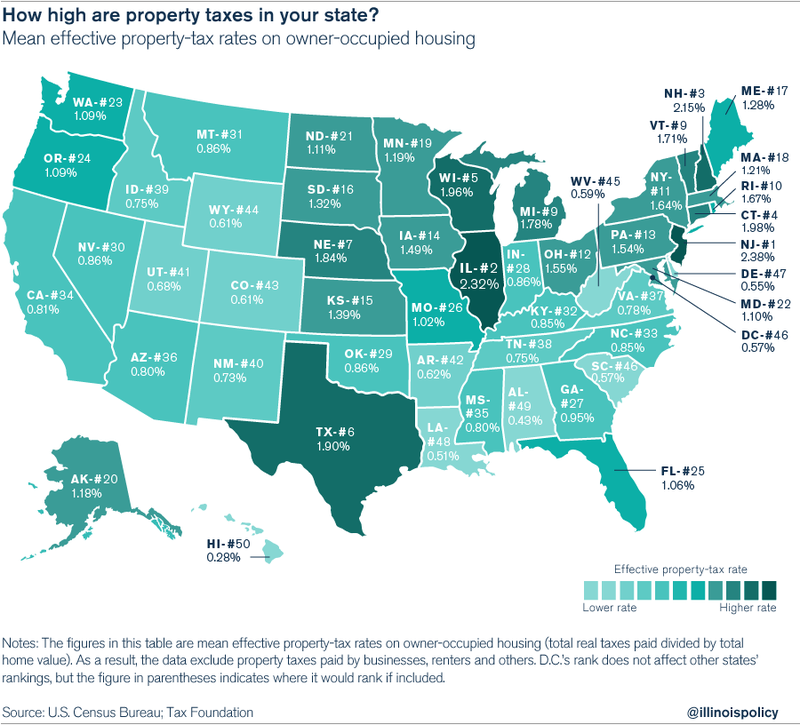 The report, which shows the effective property-tax rates in each state, ranks Illinois as the second-highest property-tax state in the U.S. The top spot goes to New Jersey, where the effective property-tax rate is 2.38 percent, barely higher than Illinois’ 2.32 percent. The Tax Foundation’s report is in line with an earlier study by WalletHub that showed the dollar amount for property taxes in each state. WalletHub’s study also ranked New Jersey’s $3,971 as the highest average tax burden, while Illinois’ was just a shade lower at $3,939. An effective property-tax rate of 2.32 percent means that if a typical Illinois homebuyer purchases a home at age 30 and lives there until the age of 79 (the average American life expectancy), that homeowner will pay more to the government for the privilege of owning a home in Illinois than the home is actually worth. If that homeowner lives in that home a few years beyond age 73, the property taxes paid will have surpassed the home’s value. For example, an Illinoisan who buys a $200,000 house will pay $4,640 in property taxes each year, or $46,400 per decade. Owning an Illinois home for a little more than four decades means that person pays property taxes equal to the entire value of the home to the local government. At a property-tax rate of 2.32 percent, it takes 43 years for an Illinois family to pay property taxes equal to the value of their home, compared with 51 years in neighboring Wisconsin, 67 years in Iowa, 98 years in Missouri, 116 years in Indiana and 118 years in Kentucky. Illinois homeowners should not pay more to the government for the privilege of owning their homes than their homes are actually worth. The property-tax system needs reform so that Illinoisans can own the homes they buy rather than rent them from local governments. Help for homeowners begins with capping property taxes at current levels, which are already the second highest in the U.S., and enacting reforms that will allow local officials to ease the property-tax burden. Gov. Bruce Rauner’s property-tax reform bill, House Bill 4224, would freeze property taxes at current levels unless local voters approve a future property-tax increase. It would also give local governments the tools to control the cost of government, such as allowing local officials and taxpayers to reform collective-bargaining agreements and have contract work competitively bid rather than forcing all contractors to bid at the prevailing wage law’s mandated wage levels. Illinois requires these reforms in order to rein in the cost of government to balance a much-needed cap on property taxes. Additional reforms under consideration by the lieutenant governor’s office include consolidation efforts to eliminate duplicative government bodies. DuPage County has taken a lead on this initiative, and provides a case study for the rest of the state on streamlining government for taxpayers. Illinois has nearly 7,000 local taxing bodies, by far the most in the country, making government consolidation long overdue. Consolidating local government would result in less duplication of functions and services as well as less administrative overhead, which means smaller property-tax bills for those who fund all of these activities: local homeowners. Illinois is home to the nation's second-highest property taxes. It's time for homeowners to take control. Sign the petition to freeze property taxes.